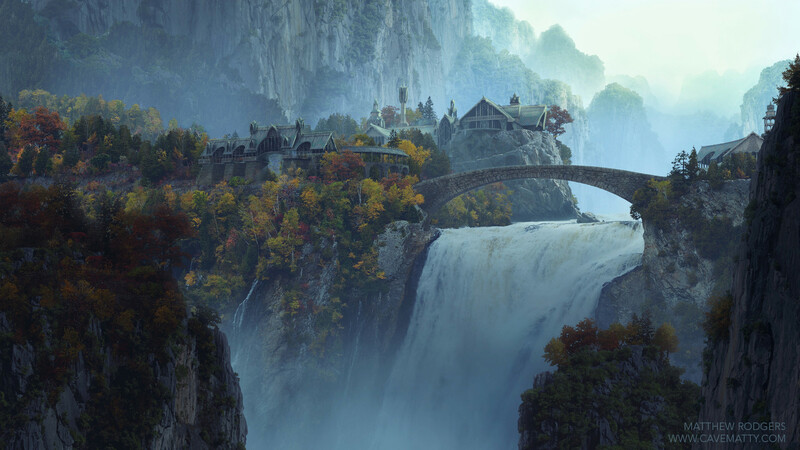 This matte painting took out top honors in a contest over at CGChannel. The competition was run by Jonathan Berube, who kindly provided a great plate to work from. The task was to remove any signs of the modern world, then add Rivendell and modify the environment until it looked like it sat in the world of the Hobbit / LOTR films. I 3d modelled the buildings of Rivendell in Maya and then painted over the renders. Photographic resources were my own photos from China, and from cgtextures.com. Then I reprojected the matte back onto 3D geometry to get the animated camera move below. I also animated the birds and composited in some practical mist effects. Here is the video with fully animated camera move followed by a process breakdown. You can watch it in HD over at youtube here.